I don’t mean to put down dedicated casual gamers, but unless you have owned and/or loved more than three different consoles in your life, you probably won’t be able to fully understand the insanely epic awesomeness that is Game Dev Story. This is undeniably a gamer’s game. My day effectively stopped when I started playing Game Dev Story yesterday. I just couldn’t put it down the entire day. When my boyfriend got home and I showed it to him, he couldn’t put it down. He wouldn’t give the phone back either. Instead, we sat huddled together, staring at the tiny iPhone screen, just playing for HOURS. If we hadn’t learned to share, this might well have destroyed my relationship. 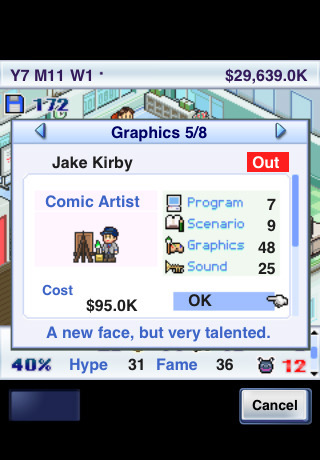 As you might have guessed, Game Dev Story simulates what it’s like to head a game development company, but you don’t actually deal much with the little details. Instead you’re responsible for the big decisions: choosing the projects, hiring and firing staff, negotiating licensing fees, that sort of thing. There’s more than enough to keep you involved, but the game doesn’t require a lot of micromanagement, which is fantastic. There are dozens of different genres and categories of games for your company to develop, and every game you create lives or dies based on its Fun, Creativity, Graphics, and Sound stats. It’s up to you to make the tough decisions, such as when you need to hire an expensive contractor or deciding how much advertising a game needs. You can pour your efforts to making a handful of critically acclaimed original games or just pump out a ton of quick trash. There’s no real right or wrong way, provided you can keep your company afloat. In addition to being a remarkably well-crafted sim, the general premise is flawlessly executed. It plays out like a satirical History of Video Games 101 as you encounter thinly-veiled parodies of actual systems, like the Senga Uranus and Intendo Game Box. Game Dev Story will run on the iPad, but not natively, and the uber-retro graphics and sound aren’t really much to write home about, but given the target audience, I’d be inclined to let that slide on account of unchecked 80’s nostalgia. Less endearing is the cramped portrait orientation and lack of save slots, and the playing area in general feels fairly crowded and inefficient. But at the risk of blowing my reputation as a cranky critic, I have to admit, I honestly loved Game Dev Story. It was like watching the story of my life unfold from a different angle with humor and charm, reminding me of all the old video games and consoles I’d loved. The incredibly niche market and relatively high $3.99 price tag means Game Dev Story probably won’t ever be able to compete with Angry Birds, but if you’re a gamer, it’s worth every penny. 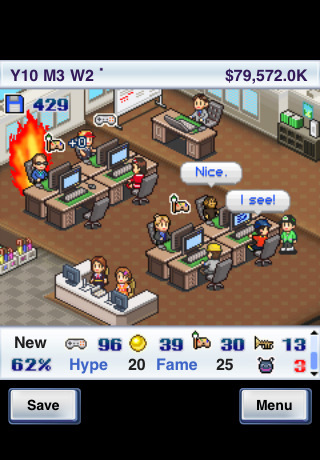 AppSafari review of Game Dev Story was written by Tracy Yonemoto on November 8th, 2010 and categorized under App Store, Featured, Fun, Games, Resource Management, Strategy. Page viewed 4900 times, 1 so far today. Need help on using these apps? Please read the Help Page. Oh my god, this is a simulator for any small up and starting game studio lol. It’s like playing my internship in portable form XD. I loved this game too. Needs some work on longevity. Like randmoizing names and the “world” you’re in, so a Mini-Skirt Board game would be more popular than Dungeon Fantasy! And you’d have to figure it out with each game.